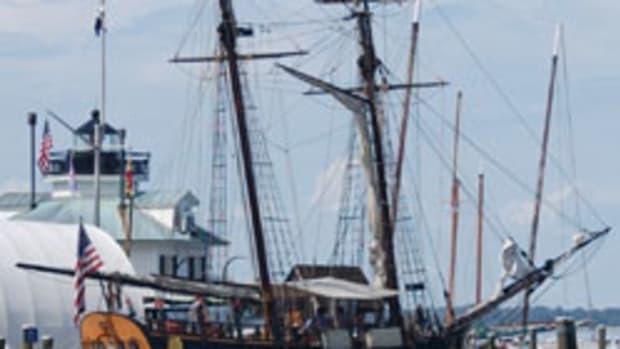 The St. Michaels, Md., harbor will transform to an image of days gone by with several tall ships and visiting vessels docking at the Chesapeake Bay Maritime Museum throughout the months of May and June. From May 5-12, the schooner Sultana will be dockside at the museum, and open for boarding to all museum visitors from 2:30-4:30 p.m. on May 8. The schooner Sultana is a replica of a Boston-built merchant vessel that served for four years as the smallest schooner ever in the British Royal Navy. Using the British Admiralty’s documentation of the original Sultana, she has been recreated to offer a glimpse of 18th century seafaring life. Launched in 2001 at her base port of Chestertown, Md., Sultana provides educational programs for more than 5,000 students each year. Click here for the full announcement with photos of some of the ships.